Years ago, as a young brand builder at Procter & Gamble, I was part of the team that launched Febreze, and led the launch in Canada. I worked tirelessly for months, bringing a core (and then ever expanding) team of like-minded people together to get this new-to-the-world product category to market. The night before “SOS” (start of shipment), I went to the warehouse to watch the pallets of product being loaded onto the trucks. The next day, I spotted the first bottles of Febreze “in the wild,” on store shelves and ready to be purchased. In the coming weeks, as the bottles turned up across the country, I did numerous “store checks” (a P&G right of passage), checking the shops to ensure the product is stocked, priced properly, and well merchandized). Then we turned on the advertising. The rest is marketing history. I’ve long since moved from selling soap to creating content, but I still get a kick out of seeing my stuff in the wild. We live in a digital age now, with so many products and services compiled by what Nicholas Negroponte calls “bits” instead of “atoms.” Just this week alone, I met up with: an app entrepreneur, the head of a new mobile service that’s looking to provide a revolutionary solution to sell more movie tickets more people, and a successful blogger. The impact of their products is real, but their products are virtual. Think about that: a real, physical object. There is something incredibly satisfying about physicality. It’s more than nostalgia; there’s a comfort in staying linked to the physical world. And in our digital age, people often ask me why I start with books. There are many reasons both creative and commercial, but despite the availability of e-books, the physical book is a real artifact that readers have a real world relationship with. Don’t get me wrong, I love Netflix as much as the next content addicted creator, but there’s something transient and ethereal about online content; whereas the physical novel possesses an authority of physicality. Now that AWESOME is bringing its books to screen, we get to have the best of both worlds. When I landed in LA last week, jet lagged and discombobulated, one of the first things I did was a P&G style store check. I wanted to see our work in the wild, so I headed to Target. 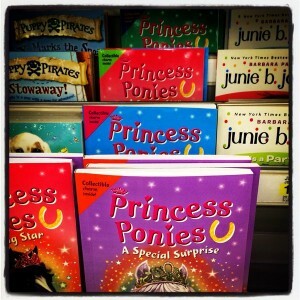 The team at Bloomsbury (the good people behind Harry Potter) have done an amazing job publishing our ‘Princess Ponies’ brand all over the world, and it was a genuine thrill to stroll into the book section of Target and spot four titles stocked and merchandized for people to buy. I know I could simply check amazon or bn.com to see the books listed online, but there’s a sense of accomplishment that comes with seeing something you dreamed up from nothing more ethereal than your imagination living in the real world.